I love baskets!! All shapes and sizes. I use them for so many different things. I will use them as a decor piece or to organize things (pretty storage). You can use baskets for just about anything! Most of the baskets I own, have either been given to me as part of a gift and I recycled them or I purchased them at a thrift store/yard sale. 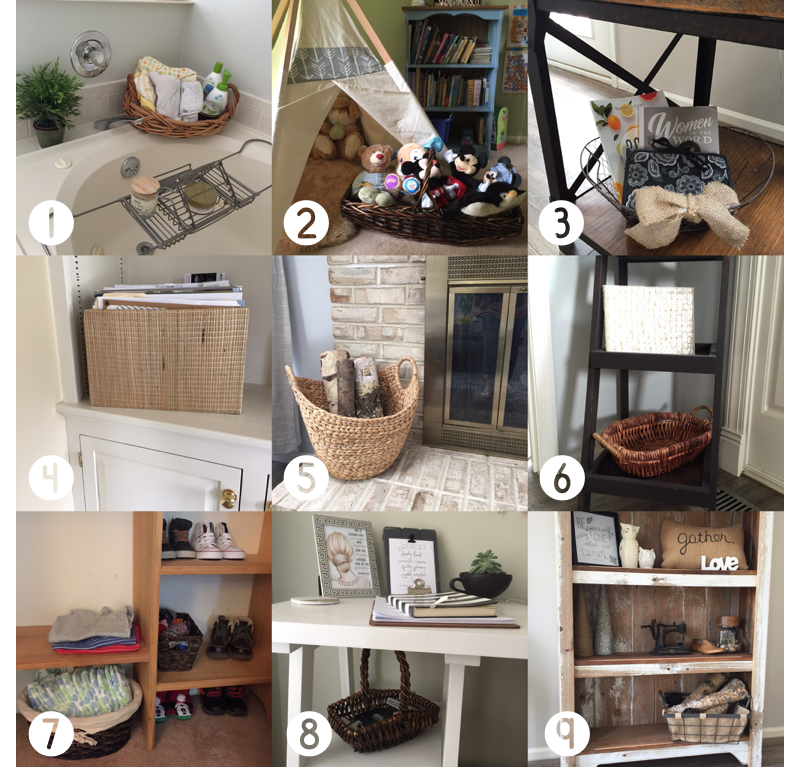 I have so many baskets in my house I didn't know which ones to use for todays post. The ones that I included are not even half of what I own, but I wanted to give a few different ideas of how you can use them around your home! 1. Use a big wide basket in your bathroom to hold towels and other things you need. I have mine on the edge of my tub with towels, bath salts, baby shampoo, and a few bath toys! Functional & pretty! 2. Use a big basket to hold all of your kids stuffed animals or maybe some books. They are easy to put away and easy for your kids to find! 3. Use a wire basket to hold a few magazines in your living room or maybe keep whatever book you are reading in there or place a few picture albums in there for your guests to look at! 4. This square basket used to have something else in it, but it's so old, that I forget. I use it to keep our files of all our important paperwork. You can even tie a bow around it to make it look a little more decorative! 5. This is one of my favorite baskets! I love the shape. I keep it on my fireplace all year around. I currently have some white birch wood in mine. You could also put regular wood with some pretty branches mixed in. 7. I use this basket for diapers and wipes and I also have a smaller one downstairs, so I don't have to walk up and down the steps every time I need a diaper! 8. I use this little basket to hold my stamps and other journaling supplies. You could keep a small one like this on your kitchen counter to put your keys and other little things that you need often. I have it on my desk upstairs where I do most of my work! 9. This is another basket that I use to hold wood, but it's just for decoration. I am trying to think of something else to put in there, since I already have a basket with wood. I really love the look of this one. Those are just of few of the ways I use my baskets, but there are a million different things you can use them for! That's why they are one of my favorite things! They are functional, but also pretty to look at! What do you like to decorate with?